Team building corporate events since 1985. Corporate team building events with Dial M Productions. We offer team building workshops, team building activities and corporate events - specializing in team building interactive activities in Los Angeles and Las Vegas. CALL 818-953-4256 or send an email to dialmproductions@yahoo.com. Get your employees motivated with corporate team building activities! Our custom designed team building workshops will boost the morale for any size group. Our interactive team building leaders and facilitators lead the way to inspiring your teams to work together and communicate in fun, exciting team building games and activities. 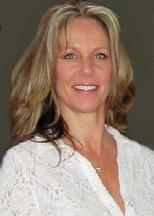 We offer Los Angeles team building events in California, Las Vegas and Nevada. Our team building events are not rope courses. We incorporate interactive team building activities, game shows, sports picnic games, and leadership team building workshops into the team building event we design for you. Our goal is to bring your company together as a unified team. Fun, morale boosting team building events that inspire company spirit and team moral. We use your goals to custom design our team building activity to get your message across. Transform the typical corporate meeting into remarkable and memorable. Dial M for Memorable Team Building Events. From Los Angeles to Vegas, we've been the event planner for major corporate team building events. Our creativity, hands-on guidance and professionalism have earned us the title of team-building and event-planning specialists in Southern California and Nevada. With our unique approach, you get it all: personalized team building activities, custom team building scripts, full-scale productions, interactive team bonding events that inspire your employees. Our team building exercises are incorporated into: Corporate Game Shows, Team Building Murder Mystery Shows and Dinners, Company Picnic Games, Sports Games, Casino Team Building Events, Drum Circles, Team Bonding Culinary Challenges, and Corporate Team Building Interactive Workshops and Team Building Programs. 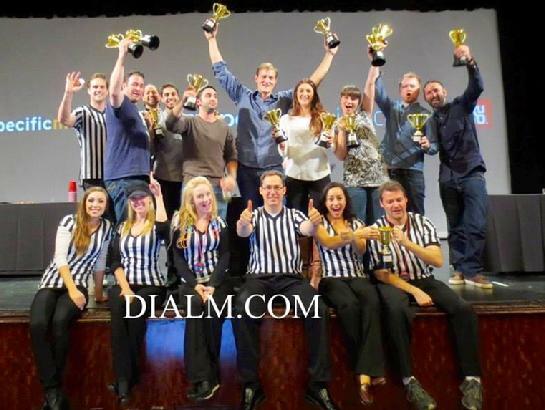 #DialM is your Team Building Event Planner. It may be business, but that doesn't mean it can't be fun. The business event planners at Dial M Productions turn the mundane corporate occasions into powerhouse events. Since 1985, our business event planners have guided major corporations and casinos, creating unique and inspiring productions that bolster company spirit. Interactive team-building games with over 97 techniques keep the laughs coming and action moving. Put your company in high gear with the preferred business event planners at www.dialmproductions.com. Running out of ideas for that next corporate event? Not to worry. Dial M Productions are "the" event planners for California and Nevada. Commissioned by high-profile corporations and casinos, our in house event planners have a knack for putting the zing into every occasion. Our specialty is corporate team building: inspiring newcomers while boosting the morale of existing staff. In fact, our event planners created successful productions, used by the US Army, Air Force, and Marines to enhance morale overseas. With events in Northern and Southern California as well as Las Vegas, our professional team knows how to produce energizing events that encourage participation, renew company spirit, develop communication, strengthen management skills, and entertain your guests in a way that will keep them talking about your event for years to come. Dial M Productions, specializing in corporate events since 1985. We design team building workshops to accomplish your goals, in an atmosphere where learning is fun! Our events are versatile enough to inspire new teams, while boosting the morale of existing ones. OUR GOAL... Our team building games build management skills, develop teamwork, teach team building communication and listening skills, while renewing company spirit and motivation. Our team building workshops create a risk free environment where people learn "theory through practice", discovering their potential in a creative, non threatening way. We insure that participants will become fully involved in teamwork, communication and creative problem solving, while having a great time together! After a short time, there will be a noticeable change in the mood and outlook of the participants. They will start to experience the benefits of a group that bands together to accomplish a goal. This will unfold naturally, as one of the basic tenets of our workshops is that they are taught in a non-evaluating atmosphere, where elements of trust, support, and communication are emphasized and required. You will notice an inspired desire to try again, to get it right, motivated by team working games to improve their team building skills. And in the process, they'll be having an enormous amount of fun! Teams will do anything to win a link in the "Longest Chain Game Show!"" Turn up the fun with corporate team-building workshops by www.dialmproductions.com. Our expert speakers and motivators tailor the event, per your company’s goals and image. Created with entertainment and interactive games, incorporating techniques and fun exercises, our corporate team-building workshops stimulate participation in a non-threatening atmosphere. Your staff enhances communication, listening, management skills—as the process inspires and boosts morale. Put our success record in the corporate culture to work for your company, let us design your upcoming corporate team-building workshops. The fun and inspiration are guaranteed! Corporate team building workshops since 1985. If it can be imagined, we can create it. Dial M Productions—renowned theme party planners—are experts at producing events with real pizzazz. We tap our rich resource of outstanding performers and artists to create unique events. We’re no ordinary theme party planners. Our events have gained recognition from coast to coast: murder mystery dinner shows, variety bands, celebrity impersonators/look-alikes, Vegas casino entertainment, musical reviews, hypnotists, and so much more. We completely personalize every event, reflecting your goals and company image. With branches in Northern/Southern California and Las Vegas, Dial M Productions’ theme party planners are your ticket to success. This hit team building activity empowers teams to create America's next superstar act. The show's celebrity impersonator judges Paula Duel, Simon Cow, and Randy Jack, down the competitors to a select group of semifinalists who perform for the studio audience (your guests). The judges have their say after every performance, but it's the studio audience that determines who will advance to the next round of the competition and who will go home. This event can also be a competition for departments, new products, new marketing ideas... Singing is only one way of competing. Ask us about how to turn your company event into an "American Idol Tribute Show". Need to bolster team spirit? Talk to #DIALM about our "casino night" team building events. Our successful track record in the corporate culture speaks for itself. Providing "casino night" theme parties since 1985. It’s no surprise that high-profile corporations use our "casino night" theme party planners to enliven team spirit and boost company morale. More than an interactive game, our "casino night" theme parties sharpen strategy and critical thinking skills—while turning up the fun with casino gaming equipment such as; Poker, Craps, Roulette, Blackjack, Texas Hold’em, Let it Ride, Pai Gow. 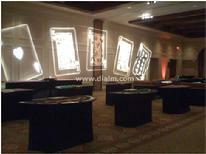 And our "casino night" theme party planners customize events to reflect your company’s specific goals. From opening cocktails and the practice session to the final competition, the excitement of Las Vegas and professional casino dealers parlay your employees into a whole new dimension of team building with quality service, high end casino gaming equipment rentals and top of the line dealers and pit bosses. American Idol Tribute Style Team Building Events. Click picture to see video. Dial "M" is for murder . . .murder mystery team building dinner theme party planners, that is. The perfect social mixer, our team building murder mystery parties are "Meetings To Die For". With everyone a suspect, our murder mystery dinner theme party planners create an unforgettable evening of laughs and drama, personalized to your guest list. Professional actors ignite the plot and our sound engineer provide a custom murder mystery soundtrack as Detective Riley encourages teams to piece together clues and solve the mystery. With our high quality sound system, experienced sound engineers and wireless microphones for each member of the cast, this production is a top of the line corporate event. Make your next corporate event a show-stealer. Call our www.dialmproductions.com murder mystery dinner theme party planners today! Comedy, entertainment, and sheer magic. That's Dial M's unique corporate events. Our Hollywood look-alike theme party planners take your event to a totally different realm. Nostalgic, interactive performances let your guests mingle with the "stars." Creating a night to remember, our Hollywood look-alike theme party planners produce Celebrity Impersonator Hollywood Game Shows variety with all the great Celebrity Look Alikes such as: Marilyn Monroe, Donald Trump, Jack Nicholson, Cher, Tina Turner, Dolly Parton, Elvis Presley. Buddy Holly, Frank Sinatra, Liza Minnelli and more. You can also book a tribute to: Frank Sinatra and The Rat Pack, plus other tribute bands, such as The Beatles, Neil Diamond, The Police, U2, John Lennon, The Eagles, Tina Turner, Cher, David Bowie and many, many more look alike celebrity tribute acts to complete the evening. There will never be another night like it. Contact our #DIALM Hollywood look-alike theme party planners now. Breathtaking and simply stupendous. Everyone will be talking about your unique event for years to come. Our cirque and circus theme party planners really know how to create extraordinary events. Take our cirque specialty acts. A professional group of varied entertainers, available individually or in one spectacular Cirque Stage Show, perform a blend of gymnastics, dance, tumbling, acrobatics, juggling, trapeze, and aerial acts. The cirque and circus theme party planners at Dial M Productions also book entertainers such as: fire dancers skilled in entertaining with flaming torches, stilt walking (with fantastic stilt walker costumes), aerial cube, contortion, juggling, clowning, and working with Hollywood animal actors. Plus your event can be even more colorful with strolling costumed circus characters/performers, available for photo ops and added atmosphere. Watch the show and then see if your team can learn a few circus skills to WOW the crowd. Let our #DIALM cirque and circus theme party planners produce your next inspiring team event! Need prices? Give us a call or click on this logo to send us an email for a same day price quote. We Make Your Event Planning Simple!" Our team building company services: Los Angeles, Southern California, San Diego, Orange County, Long Beach, Anaheim, Palm Springs, Santa Barbara, Newport Beach, Malibu, Bakersfield, Corona, Laguna, Ventura, Northern California, San Jose, San Francisco, Cupertino, Reno, and Las Vegas Nevada.